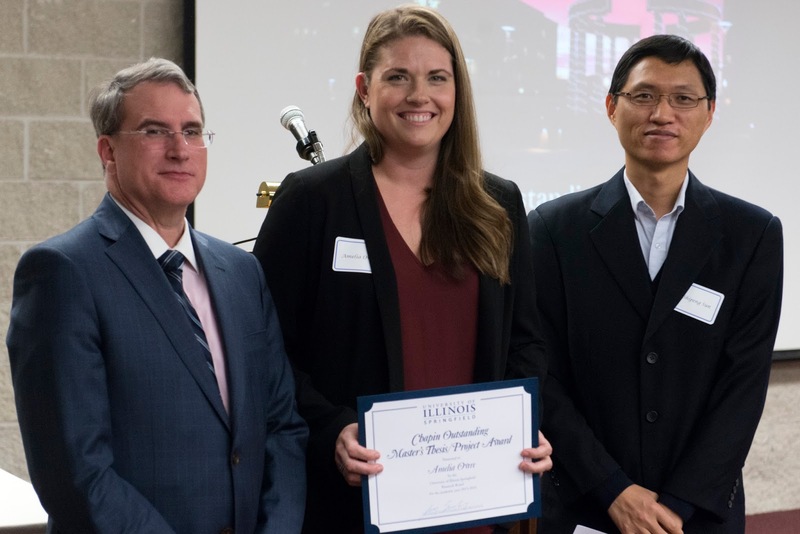 The University of Illinois Springfield Research Board has awarded Amelia Owre with the UIS Outstanding Master’s Thesis Award for the 2015-2016 academic year. The award was presented during a ceremony on February 6, 2017, on campus. Owre, a former online student from California, graduated from UIS in May 2015 with a master’s degree in environmental sciences. Her thesis was entitled “The Impact of Sea Level Rise on Carbon Storage and Sequestration in the Tijuana River National Estuarine Research Reserve.” Her thesis chair was Shipeng Sun, UIS assistant professor of environmental studies. Originally from Dallas, Texas, Owre attended the U.S. Naval Academy and majored in Oceanography with an emphasis on meteorology and climate science. Following graduation, she became a Naval helicopter pilot and flew three different variants of the H-60 Seahawk. Owre is now out of the military and is the director of training for a drone training company, after spending her last years of active duty as a military drone flight instructor.